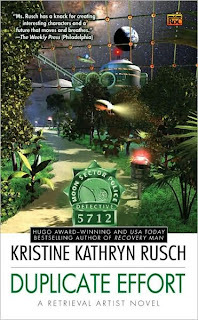 Kristine Kathryn Rusch's Diving Into the Wreck (review) was recently release by Pyr and is easily one of the best Sci-Fi reads of this year. 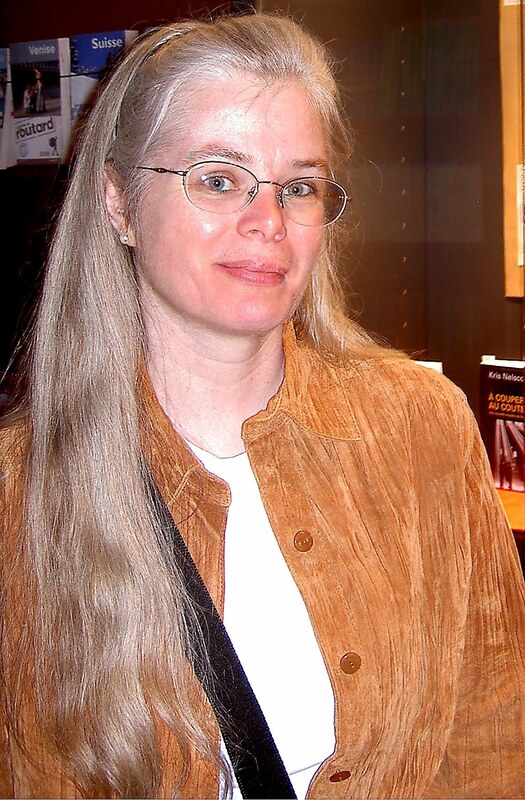 Kristine has won two Hugos (once for Edtior and once as an Author) and a John W. Campbell Award in addition to her many other accomplishments. 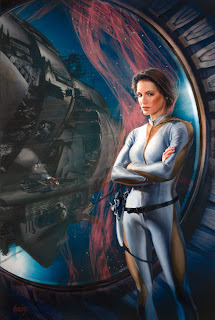 She is author of the popular Retrieval Artist series, which is now on its seventh volume as well as being an author of a veritable who's who of Sci-Fi tie-in novels for such franchises as Star Trek: Classic, ST: TNG, DS9 as well as the novelization of the first X-Men movie. 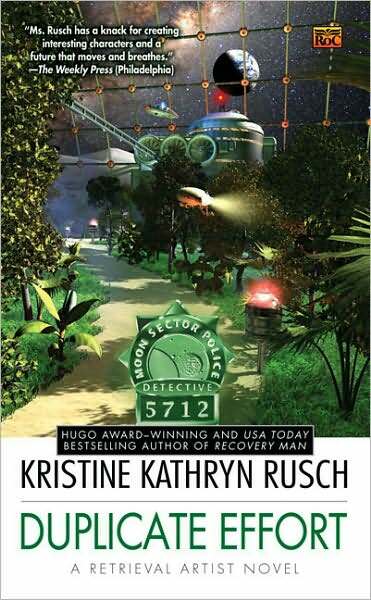 Even with all of she has done Kristine was a new author to me that I had to learn a bit more about. For all the writers out there be sure to check out her Freelance's Survival Guide, which has all kinds of useful tips. MH: Hi, Kristine. Thanks for stopping by Mad Hatter’s Bookshelf. KKR: Thanks for asking me! MH: You’ve worn many hats in publishing from author of your own novels to author of shared world universes such as Star Trek and from Editorship of The Magazine of Science Fiction and Fantasy to Publisher of Pulphouse. What was the toughest job? KKR: Editing in general. I’m good at it, but I don’t enjoy most of the work. I love finding new authors and telling the world about them, and I love putting a magazine together, but the business aspects—coordinating between publisher and writer, being in the middle, does not suit my personality at all. I am not a mediator. I’m an iconoclast through and through, so making nice all the time doesn’t really work for me. MH: For those who haven’t read Diving Into the Wreck, what can you tell perspective readers to whet their appetites? KKR: If you like space opera, you’ll like Diving. If you don’t know what space opera is, but you like thrilling adventure fiction, then this is your book. I deliberately wrote sense of wonder science fiction, and the readers tell me I achieved it. MH: Diving Into the Wreck originated from a couple of novellas published in Asimov’s. Did you always have it in mind to turn it into a longer story or did the episodic feel just develop? KKR: My brain is rebellious too. It never tells me what’s going on. I thought Diving was a stand-alone novella. Then I wrote Room of Lost Souls. It wasn’t working until I put Boss in it. But it wasn’t until I finished that novella that I realized this was all of a piece and it was a novel. This, by the way, is often how I write. Out of order and in pieces. Then I have to put the full story together like a jigsaw puzzle. I actually sat on the floor with pieces of my first novel and put them in different order, trying to figure out what way it made sense. I don’t have to do that any more, but mentally the process is the same. MH: You’ve sold another Diving novella to Asimov’s and although you get closure on a lot it is clear Boss has more to do. Will there be another book that follows Boss’s exploits past Diving Into the Wreck? KKR: Yes, there’ll be another book. I hope it’ll be with Pyr. They’ve been very clear that sales will determine whether or not the series continues. So buy the book quickly, folks! And of course, there will be short stories and novellas. It’s too big a universe. I’ll probably be writing stories in the “Diving” world forever. 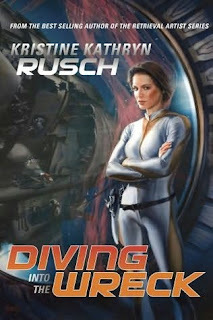 MH: The cover art for Diving Into the Wreck certainly harkens back to the Golden Age of Science Fiction. Were you happy with the design and do you feel the woman depicted fits “Boss”? She looks a little like Kate from Lost to me, which is not necessarily a bad thing. MH: In an article a few months back I lamented my dearth of Science Fiction reading and the fact I felt it has lost its specialness over the years due to fact so much technology has come to fruition. Do you think the mystery is going out of Sci-Fi as we advance technologically? I wrote essays about why sf lost its specialness, most recently in my Internet Review of Science Fiction columns (here) and also in a column for Asimov’s called Barbarian Confessions. There’s more because I think sf wrapped itself into a tight bubble and stopped writing sensawonder stuff. If we go back to that, sf will grow again. So in some ways, “Diving” is me putting my money where my mouth is. MH: You definitely achieved sensawonder with Diving. You’ve been known to change and mix genres over your career covering everything from hard Sci-Fi, Mystery, Romance and even a bit in the non-fiction realm. Are you more inclined to challenge yourself with variety? What genre is your favorite area to work in? KKR: I didn’t know what a genre was until college and my buddy Kevin J. Anderson enlightened me. (We met in a college creative writing class.) I thought everyone went to the bookstore and grabbed whatever looked interesting. I didn’t know that people went to sections. I didn’t. I still read that way, and so I write that way. If I’m writing something dark, then I read something light. If I’m writing sf, I read mystery. I’m a big fan of variety. MH: Who are some under appreciated authors that may be flying under the radar of my readers and I that we have to check out? KKR: Oh, gee. There are so many…I do a recommended reading list on my blog. Check that out because I’m always finding someone new in all of my genres. . Also, read the magazines and the short story collections. That’s where the new writers show up first—and you can discover them first. Right now, Asimov’s is going great guns and so is Alfred Hitchcock’s Mystery Magazine. And I read all of the Year’s Best volumes, so that I can catch what I missed. I know you wanted particular authors, but there are so many that it’s easier to point to venues. MH: I think you just sold me on getting an Asimov's subscription for the first time in years. If you fell down the rabbit hole what are the 2 books you’d want to have with you? MH: In keeping with the name of this blog what’s your favorite hat? KKR: My Cubs baseball cap. But I adore all hats, and wear them when I can. KKR: I’m terribly shy. (No one believes that, but it’s true.) And my cats all have many, many names because their nicknames beget nicknames. People think we have more cats than we do because each cat has at least 5 names. KKR: I think we’re good. Thanks! Well you convinced me. I definitely need to go get a copy of Diving into the Wreck. I have been looking for an e-copy of Diving into the Wreck. Amazon.com has it but I have Sony Reader 350. Is there anywhere else I can find it?